Egg Carton Labels: What’s in a Name? Have you stood in front of the egg display at your supermarket lately and gotten confused by all the egg carton labels? There are a baffling number of different kinds of eggs available nowadays. Growing up, I would have thought eggs were eggs. Now I know better. 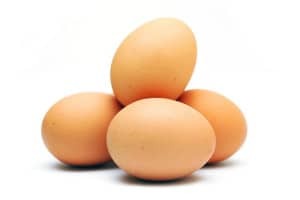 This post is intended to help you navigate the egg labels to find the healthy eggs in the supermarket cooler, either by making a purchase or making an about-face. Someone finally decided that 20,000 head of cattle or chickens stuffed in a building can’t be called a “farm” anymore. Standard white store chicken eggs are raised in CAFOs, where there may be 4 birds in a 16-inch cage. Conditions aren’t good. Waste is a big problem. These chickens eat grain, soy, and possibly animal by-products, including other chicken parts. Mmmmm, mmmm. You can find out more (than you want to know) with a simple Google search. These chickens aren’t completely confined in cages, but are allowed “access” to the outdoors, (this might only mean one small door and yard for thousands of chickens). The chickens are so used to being inside that they actually don’t break their routine to go outside. The USDA recommends a foot and a half of space per bird, so even though they’re not caged, they’re not exactly running free. These chickens (might) get (some) exercise, which is better for them than the CAFO chickens, but just slightly. On the other hand, if a local farmer says “free range,” he probably means his chickens can run around outside and get at what they need. According to Eggland’s Best website, cage free birds are out of their cages but do NOT have access to the outside. Therefore, their lives are pretty much the same as most free range chickens, minus the door nobody uses. Further, some sources indicate that the conditions of cage-free hens are not much better than standard battery raised hens. This is one of those egg carton labels that doesn’t mean a whole lot when it comes to chickens. It’s actually good for chickens to eat grubs and bugs; it improves the nutritional quality of their eggs. Grain-fed is the industry’s way of sounding good to consumers who assume that chickens only want to scratch at piles of grain all day. No assurances about the grain: it could include genetically modified soy and corn, as well as pesticides and chemicals. Whatever the chickens are eating is grown without pesticides or synthetic fertilizers. They receive no antibiotics or hormones. 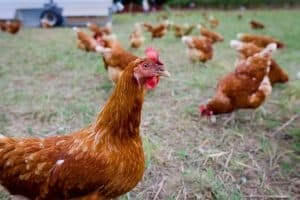 UPDATE: organic store eggs may not be worth the price premium, as the conditions of the chickens still may not be ideal. A foot square doesn’t really allow room for exercise. There are ALSO considerations about what happens to the eggs after they’re laid. See here for details. Typically, these are most nutritious eggs (more info on that ahead). Eggs branded with this label means that the chickens live outside and can eat green grass, bugs, grubs, and whatever they would naturally like to eat, along with, usually, a serving of chicken feed from the farmer. 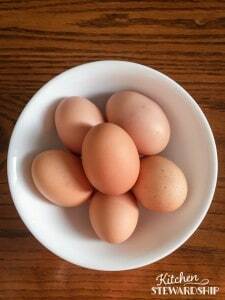 See an incredible picture of pastured vs. store eggs here. Remember that brown eggs don’t really mean anything, health-wise. The chicken’s breed determines the color of their eggs. With this egg carton label, you can be certain your chickens aren’t eating other chickens, feathers, or waste by-products of other animals. Always reassuring. However, they’re a little step over plain old white eggs for a big price jump. For me, not worth it. Make sure you’re getting a big enough health difference to be worth what you’re paying! Soy and corn. If the chickens are eating soy or corn, you may want to check if they’re GMO (genetically modified) or not. Organic feed cannot be GMO. I haven’t talked about this at KS (yet), but some people avoid GMO crops for various reasons, and it would make sense that your chickens should, too, if that’s important to you. Most of the vegetarian and grain fed eggs in the supermarket will surely be eating GMO corn and soy. Egg Carton Labels…Where to Go from Here? With all the different egg carton labels and egg terminology, choosing the best eggs for your family will probably take some research. Fortunately, I’ve been on that journey recently and put together a primer of the best eggs to buy and baby steps you can take along your own egg-hunting journey. Research shows that most of the eggs sold in supermarkets are not comparable (nutritionally speaking) to pasture-raised eggs. If pastured eggs are accessible to you, go for it! To find local sources of fresh pastured eggs, visit Eat Wild. Added Bonus: If you can find the right farmer selling eggs, you can actually spend just slightly more than standard store eggs and less than the designer eggs on the shelves! My friend gets her eggs at a paint store – no joke – and I found $1.50/dozen eggs by stopping for a roadside sign once. What do you feed your chickens? The ideal feed is a combination of organically grown grains, legumes, grasses, greens, worms and insects. Less than ideal but still acceptable to many is organic lay pellets and organically grown corn and soy. At the bottom of the heap are commercial lay pellets, conventionally grown corn and soy and cottonseed meal. Ultimately, we want to get the healthiest eggs we can afford, and still eat plenty of them. What’s your relationship with eggs? How’s your search for better eggs going? « Previous Post How Many People Have YOU Fed Today? Great post! I currently buy organic eggs. I once bought true pastured eggs from this amazing farm that I buy my bacon from. The were $4.50 but were SO MUCH DIFFERENT then even the organic eggs at the sueprmarket! And, those organic eggs still run around $3 to $3.50. So, for around a dime more… I might as well just buy the pastured eggs. It is amazing how and egg does not necessarily mean an egg…. .-= Primal Toad´s last blog ..What Is The #1 Thing You Are Grateful For? For Me, It’s Life =-. Katie, I have a question: how are fertilized eggs healthier? And another one: I wonder whether fertilized eggs are suitable for people with a pro-life opinion? I want to have chickens later in my backyard! This isn’t very good research, but I heard from a few people, including our cow share/egg farmer, that fertilized eggs are healthier. I can’t remember the reason, but it made sense to me at the time. If you have chickens yourself, a rooster helps because he keeps the hens from fighting with each other, esp if you have at least 6 hens. Thank you for the advice Katie! I’ve been eating & using the best eggs i can find (by definition outlined as you did here) for some time. *Say what? * Why on earth would they need them? They are about as healthy naturally as possible. They truly allow them free range, i’ve seen them round them up out of the front yard. I think he has been bamboozled by the powers that be into believing they are necessary. Needless to say, i don’t get eggs from them. I was so disappointed. .-= Kathryn´s last blog ..Random rambling =-. Don’t limit your search to farms (see Craigslist comment above)! Here in Vegas, there are many, many people who keep chickens in their backyards (and we have tiny yards here). There is a chicken keeping co-op in town, which is where I found mine. You could also raise your own. Chickens are fairly easy to keep as well. Most people I know keep 1-2 chickens and each one lays 3 eggs a day. You could easily make back what you pay in feed by selling the extra eggs! .-= Camille´s last blog ..Menu Plan Monday, June 6 =-. I’d love to know what breed of chicken lays three eggs a day. What are they fed? I have raised hundreds of chickens and have never yet gotten 3 eggs from a hen in one day. Once in a while, a young hen lays 2 in a day, but she takes the next day off. I have 3 dozen hens right now and find 30 eggs a day to be about right. I have no idea! The CSA that I bought from told me they get 3 eggs per day from their chickens except in the summer. Great info. Thanks for the link!. I am talking to farms about their milk now. I found one that is grass fed with supplemental feed (necessary in PA) and no rSTB or whatever that growth hormone is. It’s not organic, though. But I think giving dairy cows antibiotics is always illegal, right? They have to be separated from the herd while being treated? So the only concern would be the possible chemicals in the feed? Am I missing something? I’m actually talking milk next week, so I’ll cover your Q in a bit more depth, but yes, antibiotics wouldn’t be in the actual milk, the animal’s milk would be pulled…I think. Is the supplemental feed hay/alfalfa or corn/grain? That’s a big difference. IMO, grassfed and local are two huge steps in the right direction, raw and unhomogenized would be two more, so you’re doing great if all those are true! Everyone gets that that’s a joke, right? The cows are put to pasture daily where they eat grass. They are also fed dry grass hay and alfalfa hay daily as well as a mixture of ground haylage and silage that we raise ourselves on the land around our farm. The mixture is tested for nutrition and balanced by lab report for any vitamin and mineral supplements needed to be mixed in. (Forages and grasses vary in nutritional makeup depending on the weather and growing conditions of any given season.) Of course, since we live in the north, the cows can only graze on grasses about 8 months a year – during the winter they are fed stored grasses in the form of hays and silages. That sounds good, yes? I guess I”m trying to figure out if this milk (at $3.50 a gallon) is worth buying rather than the grass-fed certified organic local milk I can get elsewhere for $6 a gallon. .-= Musings of a Housewife´s last blog ..Fashion Friday =-. I would love to have my own chickens. Until then I buy organic cage free when only the market works or eggs from a farmer at the farmer’s market as often as possible. Sadly, pastured eggs here are $6-8 a dozen which is a budget hit. .-= marcella´s last blog ..In the quilting room =-. WOW!!! $6-8 a dozen?? That’s insane. I guess I’m really lucky to live in farm country. I can usually find them for $3 or $4 at the most. Hmmm….I have a small (read:tiny) flock of 10 hens and 1 rooster. I made the very expensive decision a few months ago to go all organic with their feed. Can’t get soy free organic around here so I get the next best which includes soy, but is organic. My flock has always been pastured, with total access to the entire 1 1/2 acres we own and the empty fields around us. Until last week. When I found the lot of ’em marching down our dirt road, oblivious to any dangers (which could include school buses and crazy teenagers) Now I let them out of their fenced in yard (which they have from 8am when I let them out of their coop) around 3pm till dark, in the hopes that they will be too busy with OUR yard and pond to bother with the road!!! This was an excellent post on all the choices out there. And if nothing else was available, I, too, would just go get the grocers eggs for .99 a dozen. .-= Cindy Young´s last blog ..NEVER too old to learn =-. Now THAT is an awesome testimony! I would buy your eggs in a jif. My mom convinced her egg lady to up her prices from $1.50 to $2 to make sure she wasn’t losing money. People want good food! You are an inspiration! And “marching down the road” – LOL!! The visual on that one is too cute. Thanks for getting me focused on this again! I just went to the eatwild site and found a GREAT producer who is right in our area. So excited! .-= Greta @ Mom Living Healthy´s last blog ..This Week’s Menu Plan =-. Great information. I just found your site,,, you are a teacher at heart and soul!! Love it…. not to add confusion to the discussion… but how about duck eggs? I’ve raised them in the past and they out produced the chickens. Also I think they cope with rain and cold better. I hope to have three in my yard next spring.. it didn’t work out this spring. I don’t know personally, but I’ve heard only good things about duck eggs! I would guess the questions to ask would be the same: what does your food eat? Thanks for all the hard work and research!! I consider myself a slight crunchy parent, but when my husband lost his job almost 2 years ago, I HAD to start buying the “gross” eggs. I felt horrible about it but didn’t want to give up eggs entirely. Like you said, I did pray alot about the food choices I was having to make just to feed my family! Yes, indeed. Any egg is better than processed food. Keep praying, it will all work out. And watch for neighbors with chickens, sometimes they’ll share for little or no cost if they have an abundance… Good luck! Sometimes I can get eggs from the bf’s parent’s homestead, but their chickens weren’t producing much for a while, so they had to conserve for their private use. I really would love to have an egg layer someday. .-= AmandaonMaui´s last blog ..Happy Father’s Day! =-. Great information. I had been on a mission to find quality eggs and in a last ditch effort, I searched on Craigslist! What a blessing. I found a couple of farmers who were open to dialogue with me about their chickens and eggs, however they all fed the chickens soy. We have been on a mission not to eat ANY soy or corn products, it is very difficult! I found a woman who was open and interested in the no soy requests. She was willing to segment some of her chickens and not give them soy products. Through her long, drawn out interactions with me about soy she started doing her own research and began eliminating soy from her diet and from the diet of ALL of her chickens. It is so nice to find local people to buy our food products from, thank you for the information you provide. What about Certified Humane? I read an article previously describing eggs and it was my understanding from that piece that CH eggs are especially healthy and worth the price because of the CH standards (Cage free, free range – literally, etc). Until I can find local pastured eggs I have been getting the CH Nest Fresh Eggs from Costco. I agree, in this case, Organic is not worth it. I have a friend with an organic farm, and he told me that adding flax to the diet increases the estrogen in the eggs, so I dropped out of the CSA I had been getting them from to avoid this. I then found that a neighboring farm sells eggs for $2.50 per dozen! Organic (non-certified), free-range, pastured, vegetarian, total WIN! That will teach me to look around a little more! In France the farmers stamp the egg with the date it was collected. I have a pic my husband took at the local Farmer’s market. WOW so much good info on eggs!! which is so helpful b/c my fam goes through 1-2 doz a week. I had previously been mostly buying our store brand Omega 3 eggs- 18 times more Omega-3’s than CAFO eggs!! I wished they were organic, and local, but I am sometimes too focused on the nutrition side and thought the way extra Omega-3’s were worth the compromise. THANKS for the info on Omega-3’s; that in eggs it is mostly the ALA – the least important for humans, as we can only use about 2% of it to convert to EPA/DHA. As these eggs’ label doesn’t have detailed Omega-3 breakdown, I had no idea!! Now I am going to find better eggs! But I agree, it is hard because most, if not all, farmer’s eggs here use soy-corn layer pellets, to supplement at least, and only a couple of farmers are certified organic. HMPH!! sigh! Well that’s okay, I am not discouraged, I can keep a lookin. My idea is that if the chickens are pastured, that can make up for a lot of the nutritional issues with conventional layer pellets- they still have pretty orange yolks! But I wonder, the issue with flaxseed causing extra estrogen- what if it was switched to a chia see regimen? that is $$ but better EPA/DHA, i think just plain better. Or good quality fish meal? I am not against that at all, I think it’s just kind of a step up from all the bugs they eat anyway. I want to have chickens of my own, maybe this year, and I wonder what the best way to feed them is for optimal nutrition….anyway i do think those CAFO eggs are worth avoiding (but better than carbage), because Sally Fallon says the fatty acd balance is WAY out of whack like 20 times more omega-6 than omega-3, which can lead to inflammation throughout your body. not good. i would recommend cutting our other less healthy things in the food budget, like CAFO meat, carbage, etc, and keep the best eggs you can afford. but i know, as a family of four living way below the so-called poverty level, it is hard to always know what the best decisions are to make. praying is good! !